Fun Propulsion Labs at Google* is back with an exciting new release for game developers. 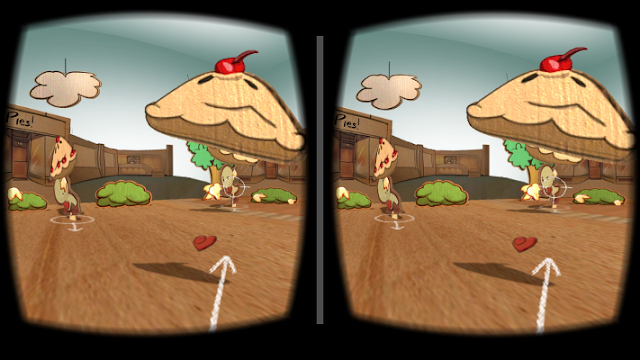 We’ve updated Pie Noon (our open source Android game) to add support for Google Cardboard, letting you jump into the action directly using your Android phone as a virtual reality headset! Select your targets by looking at them and throw pies with a flick of the switch. Look out for incoming pie! We used the Cardboard SDK for Android, which helps simplify common virtual reality tasks like head tracking, rendering for Cardboard, and handling specialized input events. And you might remember us from before, bringing exciting game technologies like FlatBuffers, Pindrop, and Motive, all of which you can see in use in Pie Noon. You can grab the latest version of Pie Noon on Google Play to try it out, or crack open the source code, and take a look at how we brought an existing game into virtual reality.